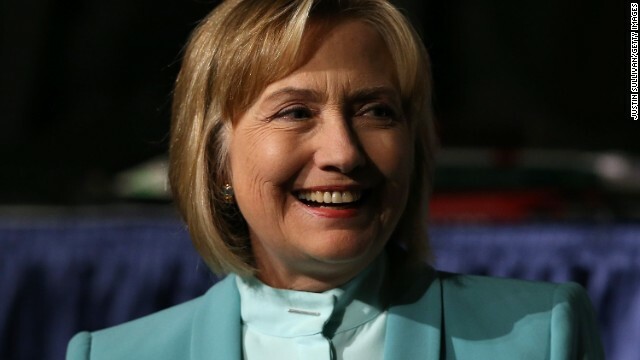 (CNN) – Hillary Clinton's self-imposed absence from the country's political discourse ended Monday when the former secretary of state issued biting criticism of Republican-backed voter ID laws during a speech to a group of lawyers. Clinton said her appearance at the annual meeting of the American Bar Association marked the beginning of a speaking series she'll embark upon that will also include an address on the United States' national security policies next month in Philadelphia. Clinton said the September address would focus of issues of "transparency and balance." The former top diplomat had not yet publicaly addressed the classified National Security Agency surveillance programs that were revealed through leaks at the beginning of the summer. The move into the political realm marks a new phase in Clinton's post-State Department life, which was previously occupied by speeches to global women's organizations and a schedule of paid appearances. She is also writing a diplomacy-focused memoir for release in 2014. In her remarks in San Francisco Monday, Clinton took aim at policies she said were unfairly limiting access to polls for minority voters, and said June's Supreme Court decision gutting the federal Voting Rights Act was a grave mistake. That ruling effectively invalidated a key provision of the 1965 law that gives the federal government oversight of states and localities with a history of voter discrimination. Clinton said the part of the law which was struck down had played a "such an important role" in the decades since it became law, and argued it was still needed to prevent undue restrictions from being placed on minority voters. She singled out efforts in Florida to remove noncitizens from its voter rolls – an effort that began, and later stalled, during later year's presidential election, but that the state's Republican governor revived following the Supreme Court's ruling. Clinton said the effort was likely to "disproportionately affect minority voters and bring back memories of the 2000 election, and the scores of wrongly disenfranchised voters." A law signed by North Carolina's Republican governor Monday amounted to the "greatest hits of voter suppression," Clinton argued. The measure, which goes into effect for the 2016 elections, includes a requirement that voters present a valid government-issued photo ID in order to cast a ballot. Like Florida's voter roll effort, North Carolina's new law was only possible after the high court's decision in June. To supplant the overturned measure, Clinton urged Congress to pass legislation ensuring voting rights aren't restricted, though the one-time New York senator acknowledged the gridlock currently plaguing her former workplace. And she called on the Justice Department to better enforce federal laws that prohibit discrimination at the polls. "Unless the hole opened up by the Supreme Court's ruling is fixed…citizens will be disenfranchised, victimized by the law instead of served by it, and that progress, that historical progress toward a more perfect union, will go backwards instead of forward," Clinton said. Good to see you Madam President! 2. Anybody got anything else? 5. I’m having trouble coming up with anything else. She looks lot better–I think she needs to take rest for a year or so. Yes, first women president Hillary16. PS: indira Gandhi became PM to largest Democracy. Hillary to first world president to pioneer. Thanks for speaking up for voting rights, Hillary. Between Citizens United and the havoc it has produced, and the evisceration of the Voting Rights Act, the Supreme Court has pretty much put a dagger in the heart of one of the basic tenets of a democracy – the right to vote and the access to do so. Hillary preach to Choir. Everybody know anyone can register to vote. Everybody know getting picture I.D. easy as pie. Everybody know half people no vote anyway. Hey, maybe Congress get new Voter Law passed, like they pass everything else.Huh? What we need is more gerrymandering, and tweaking of voter laws. With any luck at all the lines can be formed to favor republican led districts, and limit access to the polls. After all, we want to give the appearance of freedom, even if none exists. Welcome to the USA. This republican aganda of proper IDs is just another word for supression ..Republicans can and will do whatever it takes to win an election wether it be posting false laws on signs in minority led communities to scare away voters or bringing in Nathan Sproul the best at voter fraud nationwide made famous by helping the Bushs against not only Gore but Kerry as well and had a hand until caught in Romneys bid against Pres.Obama last year..O I forgot the gerrymandering and the redistricting too that the republicans have so conviently done in the name of democracy! !Any comments from the republican peanut gallery or are you still trying to lie your way out if against these facts as well!! What is wrong with showing an ID? You have to show a form of ID for nearly everything now days. I think this is one way to make sure that the dead aren't able to vote. If what has been reported these people(the dead ones) only come back to life to vote then they rest again till the next vote is needed. Smart of Hillary to delay her announcement. Keep the Republican/Tea Party guessing and dangling in the wind. They are whipping themselves into a frenzy with fear. Hillary for President in 2016! So, needing to show an ID is a big issue? I need (to show) one for serving on jury duty, for getting a job, for most >21 establishments, buying a pack of cigarettes, etc. Are we just too poor to spend $10 on a state issued ID (or variably more or less on a drivers license), and then too burdened to show it at a polling place? I have always had to show my ID for the last 3 elections, and i voted absentee while in the military. Or is there another issue? i can assume that it can be scanned to prevent multiple votes given by someone. i just dont see the harm in that. Please go away. No one cares what you think. The good people in North Carolina are not sitting around crying about the Guns Over People Shutdown Government tea potty racism. Check out Moral Mondays in that state. Seems every time anyone does anything to stop illegals from voting the left comes out ignoring the illegal and only ranting about minorities= could be they know if not for illegal votes they would lose more? Clinton will win in 2016. Who in their right mind would vote for the do nothing GOP, the stupid party!!!! What have they done for you in the last five years?????? Besides their 40 useless votes to cut your healthcare !!!!! God I hope she wins in 16. She would make such a good President. The GOP are acting like spoilt little bratty kids and they just don't deserve the honour of holding the white house until they can sort out the extremism in their ranks. We don't need a tea party president who only governs for the radical and ra-cist idiots. I don't have a problem giving ID. We must show it for any number of reasons. Why not to vote? This ensures that it is actually me that is voting not someone else. It might just make elections more fair. What is the problem? The resistance to Voter ID requirements is a joke. You have to show a photo ID to buy Claritan D at Walgreens but not to vote in an election?